← What is My Coin Worth? What Grade Coins Should I Collect? Have you every gotten a shiny new penny in your change? It’s noticeable because it looks so very different than the penny you might find under your couch cushion during spring cleaning. The condition of a coin is called its “grade” in the numismatics world. Grading is subjective art and crucially important in terms of the value of a coin. 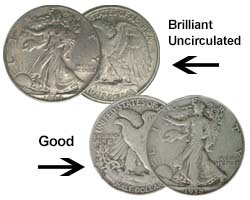 Just like in real estate, where the key is “location, location, location,” in numismatics what is important is “grading, grading, grading.” Here’s a handy chart to help you get started learning about grades. Most coins are available in a variety of conditions and many collectors struggle with decisions on what grade coins to acquire. Generally, the better condition a coin is in, the more it will cost. Therefore, budget limitations often keep us from having the quality we most desire. Deciding on what grade coins to invest in might depend on why you’re a coin collector to begin with. There are many reasons to collect coins including preserving history, a love of art, investment potential and thrill of the chase. Brilliant Uncirculated coins, which have never been used in commerce, are beautiful and might best highlight the artistic designs. On the other hand, circulated coins can have a special attraction of their own as their wear and tear can put you in mind of where the coin might have been and who might have used it. Personally, I love holding an historic bit of coinage and imagining the stories it might tell! My advice to collectors is always to find a coin series you love and start with what you can afford in terms of grade. You can always replace pieces with higher grade examples as your budget grows. At that point, you can put those previously purchased circulated pieces back into the marketplace for the next batch of new collectors to enjoy! This entry was posted in Coin Grading and tagged Choosing coin grades, coin grading, Numismatic coin grading, What grade coins should I collect. Bookmark the permalink. 2 Responses to What Grade Coins Should I Collect? A friend of mine has been thinking about collecting coins, but he wasn’t sure what grade to get. It’s interesting that you actually should look at the metals of the coin and see if they are made of precious metals. It would be nice to hire someone to let you know if the coin you received is a good grade. it’s all in the affordability of the collector.. I also like paper money in crisp condition.